At this time of year, we pause to remember forefathers—the men and women on whose shoulders we stand. They dared open seas and dark forests to bring us to our current places. We should remember them for their courage and stamina. On a bluff of Missouri limestone in Jefferson City stands a testament to those forefathers. 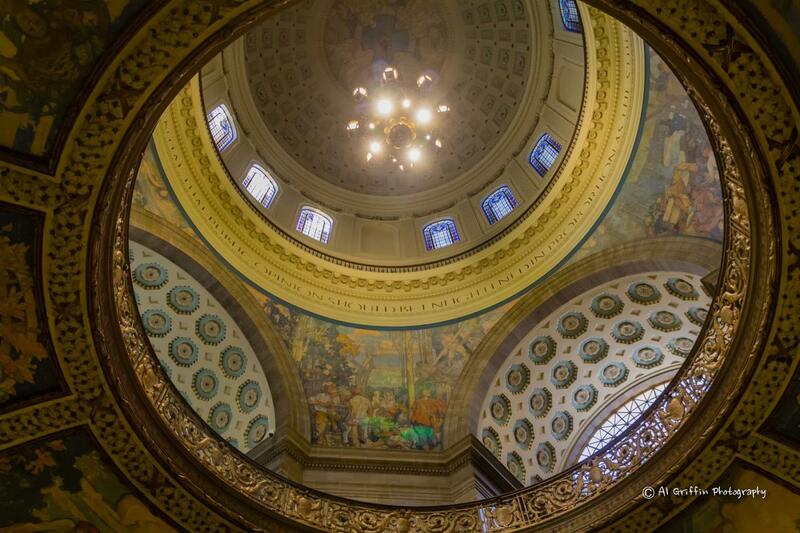 It is Missouri’s third Capitol building, this one providing 500,000 square feet devoted to deliberation and heritage. The dome rises 262 feet from the basement floor and can be seen from every direction as people approach the State’s seat of government. The second floor showcases the State’s resources and history in 40 half-moon shaped paintings. Many of these show the Mississippi and Missouri rivers that feed and define the State. Exhibits in the west wing on the ground floor highlight the State’s culture or human resources and its natural resources above ground and below. The east wing highlights the State’s history in exhibits that change every six months. Also on the ground floor is the Great Seal of Missouri, designed in 1822 by Judge Robert Wells. It declares: Let the welfare of the people be the supreme law. Grizzly bears, symbols of bravery and strength, adorn the seal and staircases for the Capitol. They suggest the heart of those forefathers of whom we should be mindful at this time of year.